Reduction of Atxn1 RNA by Atxn1 ASO353 in brain regions of Atxn166Q/2Q mice affected by SCA1. 500 μg Atxn1 ASO or vehicle was delivered by bolus i.c.v. injection to 5-week-old Atxn166Q/2Q mice. Atxn1 RNA analyzed by qPCR at 2, 12, and 18 weeks after i.c.v. injection. (A) Atxn1 RNA analyzed from the cerebellum; 2-week ASO and vehicle (n = 6), 12-week ASO and vehicle (n = 3), 18-week ASO (n = 5), 18-week vehicle (n = 7). 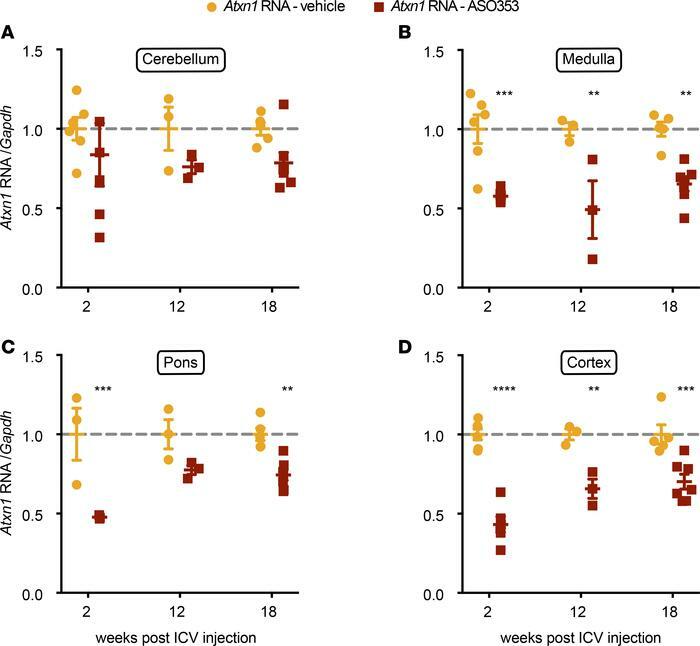 (B) Atxn1 RNA analyzed from the medulla; 2-week ASO and vehicle (n = 6), 12-week ASO and vehicle (n = 3), 18-week ASO (n = 5), 18-week vehicle (n = 7). (C) Atxn1 RNA analyzed from the pons; 2 week and 12-week ASO and vehicle (n = 3), 18-week ASO (n = 5), 18-week vehicle (n = 7). (D) Atxn1 RNA analyzed from the cerebral cortex; 2-week ASO and vehicle (n = 6), 12-week ASO and vehicle (n = 3), 18-week ASO (n = 5), 18-week vehicle (n = 7). Data are presented as mean ± SEM. **P < 0.01, ***P < 0.001, ****P < 0.0001, 2-way ANOVA.